Return once again to the enduring account of life in the Mojo lane, to the Permian Panthers of Odessa--the winningest high school football team in Texas history. Odessa is not known to be a town big on dreams, but the Panthers help keep the hopes and dreams of this small, dusty town going. Socially and racially divided, its fragile economy follows the treacherous boom-bust path of the oil business. In bad times, the unemployment rate barrels out of control; in good times, its murder rate skyrockets. But every Friday night from September to December, when the Permian High School Panthers play football, this West Texas town becomes a place where dreams can come true. 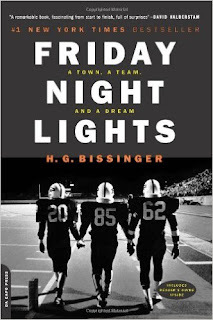 With frankness and compassion, Bissinger chronicles one of the Panthers' dramatic seasons and shows how single-minded devotion to the team shapes the community and inspires--and sometimes shatters--the teenagers who wear the Panthers' uniforms. Growing up in the northern Midwest with a high school football team that probably couldn’t even score on themselves, the lifestyle portrayed in this book is so foreign to me. . . sort of. Aside from being a massive book nerd, I am also a huge sports fan. I attended my high school football games. I watch the Chicago Bears every Sunday during the season, I bleed my Chicago Blackhawks colors. So, I understand the sports fanaticism side of the book. Let’s go back to the foreign part – these athletes are TEENAGERS. Teenagers from difference backgrounds (increasingly moreso as the years go along, more on that later). But they are treated like professional football players. The morale of the whole town depends on whether the Permian Panthers can pull out a win under those Friday night lights. They are put under so much pressure, it is amazing to me that they don’t snap more often. But this book also breaks my heart. The amount of disgusting racism that was prevalent in this story was just so sad. Yes, it is Texas. Yes, it was a few decades ago, but WOW. I feel like I could go on forever about this point, but it is really something that you just have to actually read to understand. Let me say this – anyone who has ever gone to a high school football game KNOWS the feeling of those lights. Like I said, my high school football team was so bad. So, so bad. But I enjoyed going to those games. There is a certain atmosphere at a high school football game that cannot be replicated anywhere else. Maybe it isn’t for everyone, but being someone who has experienced it – just the TITLE of the book spoke to me. That and I love… Love… LOVE the TV series. This book may have gotten a little monotonous at times, but I carried on because I genuinely enjoyed it and the subject matter. The end of this book was absolutely heartbreaking, but it was so wonderfully written. Once I got to the last 50 pages or so, my heart was beating so fast, and nothing was going to get me to put down the book. This review has probably been all over the place. But my emotions got the better of me with this book. 5/5 Stars. A Must Read.